MUSICAL CUCKOO CLOCK - HUGE Selection+ FREE Shipping ! 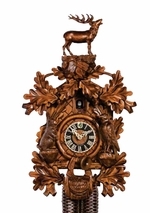 Cuckoo clocks have a rich history that is defined by expert craftsmanship and artistic ability. One thing that sets the cuckoo clock apart from other timekeeping pieces is its music. A one-day musical clock captures the sound and simplicity of nature and emits it via a music box. German cuckoo clock dancers, bears, birds, and other characters accompany the music to create a miniature enchanting scene every hour or half-hour. At My Cuckoo Clocks, you can choose the perfect quartz, chalet, one-day, or eight-day musical clock to fill your home with warm, playful sounds and accurate timekeeping. Each of our clocks is made from the careful hands of a skill artisan, ensuring unique beauty and longevity. Take a look through our selection and contact us if you have any questions about our cuckoo clocks.